The model of "GENT" is improved on a neck design. We reinforce by a surface of small triangle on the both sides of neck, even keep a elasticity. In the above picture, the piece in beige is renewal type. 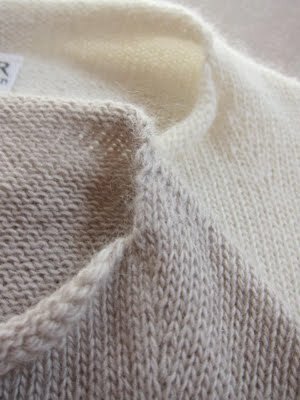 Many of the crew neck model have a part of rib around a neck. But our crew neck GENT doesn't have it and it becomes original design of us with a roll part. And our pattern has one piece from the front to the back. Then a point between them has been reinforced by a other stitch after knitting and it was been one of objectives to improve for us. And now, we had got a good method. From a point to a surface. The surface has more stronger structural than a point. Maybe you cannot find very well but it don't worry, rather it's okay. Because it's a small improvement unobtrusively for wearing more comfortable. Even though why do we talk to you this? Because we always hope that you know our thinking and we think that it is one of responsibility of people which makes things like us. We think design is realized from a heart and a kindness for someone use it.